You eat meals during meetings. You rely on protein shakes because you have no time to stop and prepare a meal. At the end of the day, you’re so fried you eat in front of the screen while reviewing email or zoning out on your favorite TV show. Sounds like you could benefit from mindful eating! Eating mindfully is just gaining popularity in the health and fitness world. Even though it’s not easy (early studies show drop out rates in mindful eating programs are high), it can improve your relationship with food and allow you to reduce body fat. 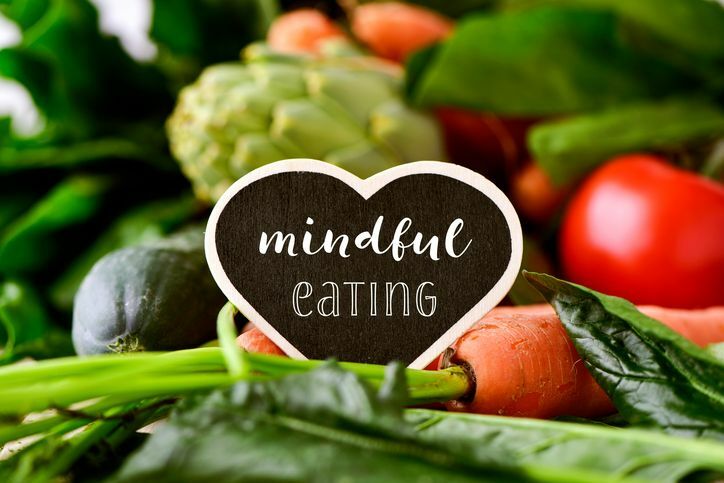 For example, in one study of adolescents, those who learned mindful eating practices had a significant reduction in BMI, suggesting a loss of body fat. A second study of African American women recovering breast cancer found that mindful eating was effective for fat loss. The reduction in obesity is thought to reduce risk of recurrence of cancer. 1) Mindful eating requires you to put your phone away and turn off the TV. Eliminating screens has multiple benefits: Screens emit blue light, which triggers food intake. Second, we use entertainment-based cues to tell us when we’re done eating. For instance, you use the end of a TV show to tell you your meal’s done instead of listening to internal satiety cues. 2) It shifts you away from reward-driven eating, which occurs when satisfying brain chemicals begin to respond to the action of eating pleasurable foods. Simply, you get a feel-good response when you eat, which is separated from your awareness of hunger and satiety. 3) Mindful eating is the opposite of stress eating, in which you nosh in order to distract yourself from reality. 4) It may affect your sensitivity to hunger hormones, such as leptin and insulin, which tell the brain you’ve eaten enough and can stop. There will be times when you can’t get away from eating at your desk or in the car, but if you make it a habit to sit down at the table, it will help set the stage for mindful eating. Your phone, the newspaper, your favorite book—put them all aside for just the 10 or 15 minutes it takes you to eat your meal. Make the exhale longer than inhale. This will knock you out of thinking about the problem at work and bring you into the moment, increasing your parasympathetic response (the rest and digest response). Many things can make you want to eat: Boredom, routine, a stressful experience, lack of emotional fulfillment. Rating your physical hunger before eating reminds you to check in with your body instead of just eating to distract yourself. Being grateful for the beautiful food your about to eat boosts mood and brings you in touch with the here and now, rather than the thoughts in your racing mind. Put half of your meal off to the side to create a “speed bump.” When you hit the “bump,” check back in, asking yourself if you’re enjoying your food and if you’re actually full. Eating should be a multi-sensory experience. One study found that when people appreciated the food on their plate with senses other then taste, they ate substantially fewer calories. As you take your first bite, make mental notes about the taste and aroma of the food. Pay attention as you continue through your meal and make it a goal to stop eating once you stop feeling the same sense of pleasure as with that first bite. Chewing is important for health—you’re GI tract doesn’t like receiving undigested food—but it also plays a role in dampening hunger, leading to a greater increase in satiety hormones so that they eat fewer calories overall. Guilty feelings are associated with a stress response, which is well known to stimulate intake of unhealthy foods and mindless eating. By owning your choices, you realize you have complete control over what you put in your mouth! Chung, et al. Weight loss with mindful eating in African American women following treatment for breast cancer: a longitudinal study. Supportive Care in Cancer. 2016. 4(4):1875-81. Mason, A., et al. Reduced reward-driven eating accounts for the impact of a mindfulness-based diet and exercise intervention on weight loss: Data from the SHINE randomized controlled trial. Appetite. 2016. 100:86-93.